Home » Blog » Hosted Apple Open Directory? Many IT organizations are shifting their on-prem software to the cloud. They are questioning whether each application can be hosted in the cloud or run as a SaaS-based solution. Oftentimes, the first query is: does a native cloud-based application already exist that performs the same function? IT admins understand that just shifting an application from being on-prem to the cloud doesn’t completely fulfill their needs. There are other things to consider in addition to it being hosted off-prem. There is a desire for the application to be run, maintained, and optimized by a third party, preferably the creators of the software. Everybody’s wondering the same thing: does a hosted Apple Open Directory solution exist, and if so, how might it work? From our investigation, it doesn’t appear as if a hosted Apple Open Directory solution is available, at least not by Apple. There may be third-party service providers willing to host the service, but it doesn’t appear that there is a standard service around a SaaS-based Apple Open Directory. If we step back to understand what the core need is here, we can see that there are alternatives to Apple Open Directory available. Apple Open Directory is an application within Apple OS X Server that focuses on directory services. The solution is a fork of the OpenLDAP platform, and it has also integrated Kerberos. The idea for the solution is to enable IT admins to more easily manage users for their Mac fleet. Other OS X Server applications help with related Mac management tasks. Apple Open Directory has been a welcome solution in IT environments that are largely or exclusively Mac focused. Other legacy on-prem directory services, such as Microsoft Active Directory and OpenLDAP, have mainly focused elsewhere. AD, of course, is optimized for Windows platforms and applications. OpenLDAP works well with Linux-based solutions, and Open Directory is focused on the Apple platforms. The challenge for IT admins as they shift their infrastructure to the cloud is that all of these directory service solutions are on-prem software. They require IT admins to procure hardware, spin-up the software, configure it, and provide ongoing maintenance plans. Then there are the challenges of high availability and security which are critical in any authentication services platform. It’s no wonder so many IT admins have been searching for a cloud directory service! Directory-as-a-Service® is a SaaS-based directory services solution. This cloud-based directory is focused on casting a wide net to support all major platforms, applications, networks, and protocols. Directory-as-a-Service treats Windows, Macs, and Linux devices as first-class citizens with full user and device management capabilities that are delivered from one central console. Applications hosted on-prem that authenticate via LDAP can be connected to the hosted directory service as is the case of web-based SAML applications. A built-in RADIUS server infrastructure ensures that secure WiFi authentication can also occur from the central user store. In short, Directory-as-a-Service is the native cloud directory service that IT admins are searching for when they ask the question, can a directory service be hosted in the cloud? 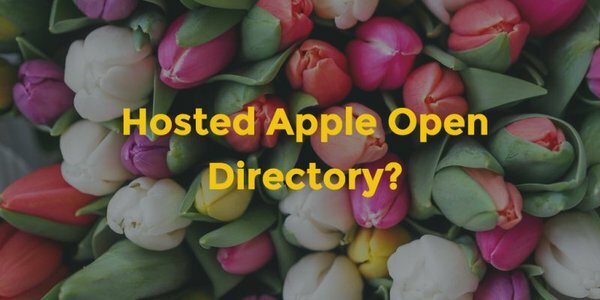 While a hosted Apple Open Directory solution may not be widely available, there are alternatives that could fulfill the need for virtual directory services. Drop us a note if you would like to discuss this further. Or, feel free to give JumpCloud’s Directory-as-a-Service a try. Your first 10 users are free forever.